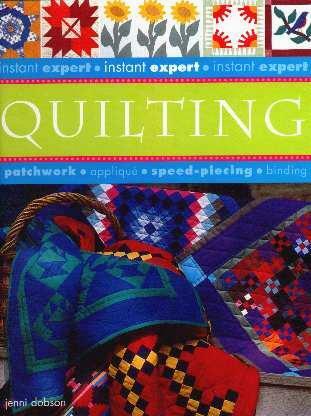 This is just one of the titles in the "Instant Expert" series - this time to help you create your own personal quilt. Whether you hand-stitch or machine stitch (or plan to do either), you'll learn the exquisite craft of quilting and thus help to continue this very old tradition. No longer a necessity to keep warm, quilting has evolved into the huge industry it is today, with so many wonderful fabrics to choose from - unlike our predecessors who used whatever scraps of material they could lay their hands on. Apparently, the earliest quilt was "found in a tomb near the Mongolian-Siberian border," and "believed to date from between 100BC and AD200". There is an intersting history behind quilting, much of which continues today. You are taken through the basics of quilt making where you'll learn the terminology and equipment, fabrics, templates, cutting, sewing, and pressing. The book is beautifully illustrated with easy-to-follow diagrams and some stunning quilts from centuries ago. Some of the patterns look so complicated and intricate but once you see how it's done, it begins to make sense. Appliqué is also covered and explained. Whether you'd like to create a simple place mat, a wall hanging or a bedspread, you'll certainly find lots of inspiration and direction on these pages. I've been to a couple of quilt exhibits, both here and in England, and have seem some in museums and at state fairs - they never cease to amaze me. Some of the patterns that caught my eye in this book include those on pages 102, 104, and 172. There are also many templates you can use. Quilting (Instant Expert) - Patchwork, Speed-piecing, and Binding may be purchased and/or ordered through your local bookstore. Conclusion - Enlightening and inspiring. A perfect gift to the "stitcher" in your circle of friends.